Another UK release that sounds "tudor"iffic :) I will keep an eye out for a US release if one is forthcoming. Isn't that a great cover? I love the colors! It was 1501. England had been ravaged for decades by conspiracy, violence, murders, coups and counter-coups. Henry VII had clambered to the top of the heap – a fugitive with a flimsy claim to England’s crown who through luck, guile and ruthlessness had managed to win the throne and stay on it for sixteen years. Although he built palaces, hosted jousts, gave out lavish presents and sent ambassadors across Europe, for many he remained a usurper, a false king. In his remarkable debut, Thomas Penn recreates an England which is both familiar and very strange – a country that seems medieval yet modern, in which honour and chivalry mingle with espionage, realpolitik, high finance and corruption. It is the story of the transformation of a young, vulnerable boy, Prince Henry, into the aggressive teenager who would become Henry VIII, and of Catherine of Aragon, his future queen. And at its heart is the tragic, magnetic figure of Henry VII – controlling, paranoid, avaricious, with a Machiavellian charm and will to power. Rich with incident and drama, filled with wonderfully drawn characters, Winter King is an unforgettable story of pageantry, surveillance, the thirst for glory - and the fraught, unstable birth of Tudor England. Wow! This one sounds really good, too. Sounds like another one for the list. I wonder if one can read after one is dead? 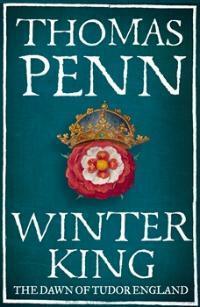 Among other things, this book should give a good idea of why Henry VIII was the man he was. I'm looking forward to it.